Since the dawn of twenty first century, we have witnessed a dramatic and profitable transformation in the mobile phones sector. They have evolved from large cellular phones to ultra slim smartphones .Since the past few years, it has become very evident that mobile is now the leader of marketing. Today, over 70 per cent of the population, use their smartphones to review products online and place an order. For eg: even ordering food through online apps after browsing through multiple options has become much of a necessity rather than a fashion. It’s not just the email or ordering products online for which a mobile device is being used, infact the work that we used to do on larger screens is now inclined towards mobile devices (smartphones). The widespread use of smartphones over the years has brought many new opportunities for the marketers. Observing the present scenario, smartphones have become an integral part of our day-to-day life, therefore the marketing strategy drafted by the marketer needs to be more influential and smarphone oriented. Below mentioned are few ways that can be used to maximise your mobile marketing strategies. Generally people are associated with‘Keyword Strategy’ in content marketing. But, in reality, you need to be concerned about the proper keyword usage and its integration with mobile marketing. To make your keyword approach work in terms of mobile marketing, you need to include the local area in combination with accurate keywords, as mobile users mainly search locally. You should also keep your keyword phrases smaller in size and therefore not more than three words should be used. While developing your mobile strategy, it is essential to keep in mind that there is a very small window of opportunity, which is present for grabbing the interest of your projection. So, the best way to do this is to include sales and special offers like discounts on the mobile sites. Including options that allows your target customers to receive alerts when any new offers arise can also help to boost up response. If you are a brick-and-mortar firm, it is very important to include your complete contact details. You should always be one step ahead, rather than just including your number and address, you should also include a location map, so that, it becomes easier for the customers to navigate and thus locate you. Today, consumers are using wide variety of mobile devices and therefore it can be the case that you have no clue about the specific type of device your customers are using or will be using. That’s why, it is essential to make sure that your mobile marketing resources are well-matched with all the wide variety of mobile devices. Furthermore, it is also important to ensure that your equipments are updated whenever a new device is out in the market. Investing in ‘Mobile Apps’ is very important for increasing your mobile marketing strategy these days. Mobile app marketing is very cost effective method and the post revenue is very fruitful, it’s extremely valuable in terms of future utility. Now after investing in the Mobile Apps , and with over 2 mIllion apps buzzing in the app stores , getting your app discovererd is the most challenging task. To tackle this problem , one of the solution that we have is App Search Optimisation(ASO). ASO is the process of optimising mobile apps so that they rank higher in an app store’s search results. The higher your app ranks in an app store’s search results, the more visible it is to target customers. The higher the traffic to your app, the more downloads you can expect for your app. 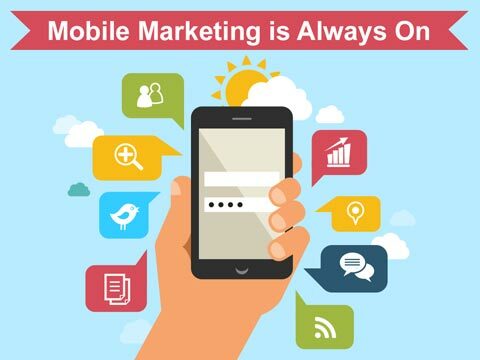 The mobile marketing background is a complex one, but by using a rock-solid scheme and by assuring that your brand materials are well-suited with up-to-the-minute technologies, you are here to sustain and witness competitive gain.